Tanmay Dharmadhikari works closely with clients to strategize protecting and monetizing their creative endeavors in consideration of the clients' vision and business model. He helps clients understand, acquire and utilize intellectual property, such as patents, trademarks, copyrights, and trade secrets surrounding the creative endeavors. 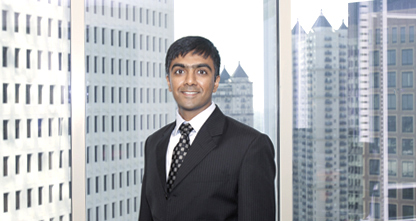 Tanmay is actively involved in prosecution and litigation of patents with primary focus on software and electrical hardware. To date he has advised clients in the business of mobile devices, network devices, data storage devices, navigation devices, display devices, vehicle infotainment, spanning the fields of telecommunications, Voice-over-IP, lighting control systems, Internet-based solutions, manufacture of devices, television broadcast to name a few. Prior to switching to the field of law, Tanmay was a software developer, programmer with hands-on experience with algorithm development, parallel programming, GPUs, and testing. Tanmay actively programmed using high-level and low-level languages such as C/C++, C#, x86 and x64 assembly programming.